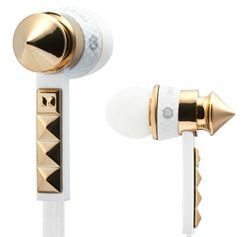 Lady Gaga headphones go for the 'leather and studs' look | What Hi-Fi? Queen of pop Lady Gaga, renowned for her outlandish fashion sense, has chosen a "leather and studs" look for the latest Beats by Dr Dre in-ear headphones to bear her name. The new Heartbeats by Lady Gaga (£130), part of the Beats by Dr Dre range, are "a reflection of the pop queen's high-end sense of style and commitment to providing fans with the best music listening experience possible," we're told. Beats by Dr Dre co-founders Dr Dre and Jimmy Lovine worked closely with the experts at Monster to help deliver "an unprecedented level of audio performance". Available in black or gold, the Heartbeats by Lady Gaga feature six sets of eartips, tangle-free cable, a carrying case and ControlTalk, which enables iPhone and iPod music playback control as well as hands-free calls with iPhone and other smartphones.